Prior non-military employment: Shopkeeping, waitressing. Civilian Qualifications: Limited basic education. Sewing, knitting, cooking, some herbology. Prior military service: Conscript for 157th Company, Last Chance platoon. Military Qualifications: No formal military education. Swift and skilled at climbing, concealment, and lockpicking. She is also noted to use offensive fel magic. 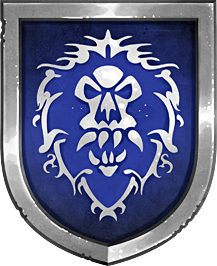 Criminal Record: Burglary, resisting arrest, escaping detention, manslaughter - Convicted and trialed in the Kingdom of Stormwind. [28.8.30] Failed anti-sha meditation. Ordered to undergo counselling under morale officer Corporal Shiiri. [2.9.30] Recommended for commendation by Sergeant Celeste Vanimedle for quick thinking and ingenuity by using an area-of-effect fire spell to assault enemy targets heavily cloaked by mists. [2.9.30] Failed to maintain composure and released a sha during battle with Jade Witch. [23.9.30] Detention: Put under detention for theft of property from Corporal Hugir Strongbrew. Stolen items included anti-sha gemstone and several silver coins. * = Last Chancer. Die with Honor.